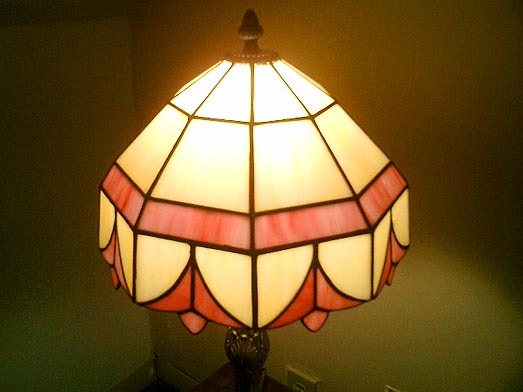 We have a very pretty lamp with a shade of rose-and-cream glass, that came from Don's parents, if I am not mistaken. I say "we have" but really it's Protein's lamp. 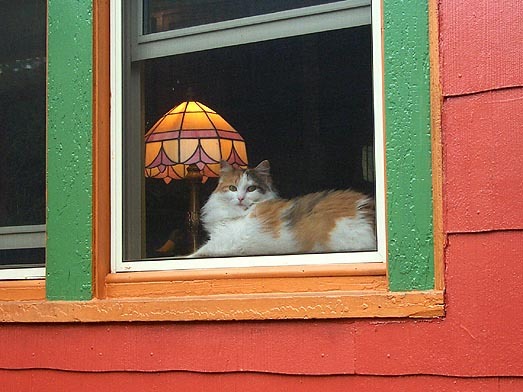 That's because for a long time, it sat by the big double window in the living room which overlooks the back yard, so Protein would spend hours watching the flying prey while warming herself underneath the lamp. It's not in Protein's window anymore, but it's still Protein's lamp. I was looking at the lamp last night, and wondering what kind of math I would have to know in order to design something like it. It's done in four horizontal sections or rows. Each section, moving from the top of the lamp to the bottom, marks a decline in the angle at which the glass flares outward, until in the bottom section, the glass pieces are perfectly vertical. The mystery, to my math-impaired mind at least, is this: How would you design something like this on paper? It's not like a panel lamp, where you basically build four flat panels and mount them all together at their edges. With a lamp like this, you'd have to plan exactly what all your angles would be ahead of time, and that would determine the dimensions of your individual pieces of glass. Or vice versa, I don't know. Either way, it would have to be carefully planned in order for everything to fit together. Don and I discussed it before bed last night, and he ended up giving me a remedial trigonometry lesson. Which was edifying but I still come up with a blank when I try to think of how to apply that to three-dimensional objects, and what the process would be to draw up design plans for such an object. This is bugging me. I hate not knowing stuff. I suppose I'll have to search the web later on to see what I can find, but I'm not sure what I'll search on. "three dimensional non-curvy objects for dummies" perhaps. Or, even better, "buy CAD program to do all the math for me". Hm. Interesting. I would figure it out by cutting out some shapes and seeing how they fit together; it's certainly possible to do it that way. If I went to math I would think of it as a problem of circumferences - what do I want the circumference of each level to be, and then how do I want each separate piece to look and how many do I want. Once you have cylinders (or angled cylinders) you've made (in your head) by joining your repetitive pieces together, then can't you join them at whatever angle you like, that's aesthetically pleasing? Or, if you like, at an angle determined by the circumference of the next level; any difference in circumference between the level above and the level below would require an angled level. I wouldn't think you'd have to figure out the angles to design it, rather that the design would determine the angles. Well, I'm sure this is all obvious. Just interesting to me to think out loud about how to do it, since I am not the type to try to work out the math. I am an epidemiologist and do plenty of statistics, goodness it's a relief to do things with my hands instead of figuring them out with my head! Figuring out is fun, though, huh. No matter how. I love it that your cat is named Protein. That is special. Well, it's definitely an issue of circumferences, to an extent. Each level would need to join to the level below it, obviously---but I think the question becomes how to angle the sides of an isoceles trapezoid so that, when you join them in a circle, the top of the circle and the bottom of the circle are the correct circumferences to match up to the rows above and below. The further away from vertical (like the bottom row) the pieces are, those pieces must be narrower at their tops. ... this is probably really easy, and I feel like a caveman trying to understand fire, but maybe if I talk it through (blog it through?) enough the answer will magically come to me. My son is marrying a gorgeous, artistic, mathematical genius, who also happens to be a great cook and an inspired writer. We got that lamp at a craft show at Wheaton Plaza in the early '90's. I think Babybastard has the companion to it. I would say start with the pattern you like on a 2d pitch like your trapazoid pieces above and then consider the z axis pitch and bend. OR just messure all the ones on that lamp and take it from there, not as fun I'd gather though. Check out this url for a good description on how to design a multi-layered lamp shade of any number of sides. No math or tables required, just careful drawing. The example shows a three layer nine sided lamp. Wow. That's totally perfect, and there's a ton of other interesting glass stuff on that site. The writing is fun too... from the Techniques page: "If you are not orgasmic with your line drawing don't expect to be blissed out by the coming of your projects completion!" "Pi x diameter you desire divide by panels SIMPLE, yes?" "Rough rule of thumb (and the rest of the fingers) is if I have to make more than 5 of the same accurate straight line pieces, I set up a jig." I oft find that dancing a little jig makes everything go better! And there's some serious lampshade math going on at this site, though it appears to directly address only the design of flat panel lamps, not tiered ones. I am also uncovering references to angled grinding of lamp tile edges using a specialty lamp bit... but there's some question as to whether angle grinding is necessary or even desirable, so I'm just going to pretend I didn't see anything on that topic for right now.